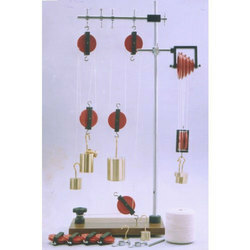 We are known in the industry for our expertise in manufacturing and exporting high quality Physics Lab Equipment. The offered range is provided in various technical specifications based on the requirements of our clients. This range is specifically manufactured using quality assured components by our expert and well-trained professionals. Further, the team aids us in offering the range within the given time - frame at the clients' end. 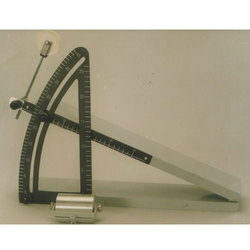 We also import and supply high end German made Physics equipment from 3B Scientific GmBH. We offer workshops to our customers of this equipment to train them in the use of these experiments/equipment. Spectrometer with rotatable prism or grating and directionally-adjustable objective tube for observing and measuring emission and absorption spectra. 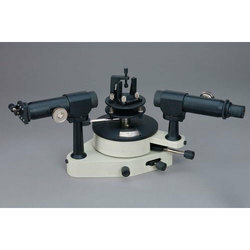 Can also be used for precise determination of the optical parameters of prisms or gratings. Includes prism with holder and transmission grating with holder. Objective tube has adjustable slit width and object distance of f = 175 mm, 32 mm diam. Eyepiece tube has continuous focusing and viewing angle adjustable eyepiece with cross-wire of f = 175 mm, 32 mm diam. Spectrometers: Three models with following features in common. Differences noted against each model. Base: Heavy cast-iron base, oven-baked paint. The heaviness of the base provides stability to the instrument. The main scale (diameter 150mm) is divided 0 to 360° ´ ½° and fixed to a table that also holds the telescope. There are two verniers reading upto 1 minute of arc, located 180° apart at opposite sides of the main scale. Both verniers are visible through two protective acrylic windows. Release of a clamping screw allows independent rotation through fine adjustment screws for the telescope and vernier scale. Mounted on a movable pillar, the telescope has a fine adjustment screw, locking screw and axis adjustment. Achromatic objective of focal length 178mm. Ramsden eye-piece 15X with cross-line graticule. With rack & pinion focusing. Collimator: Has achromatic objective of focal length 178mm. Rack & pinion focusing. Adjustable slit, length 6mm, is made of stainless steel. Prism Table: Marked with grooved lines to assist positioning of prism in relation to leveling screws. Has interchangeable clamping units for prism and diffraction grating. 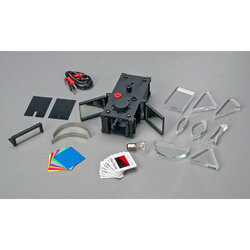 Spectrometers supplied with prism clamp, grating holder, magnifier lens and tommy bar. Objective lenses of diameter 25mm, aperture 24mm. Veriner reads to 60 seconds of arc. The achromatic objectives are of diameter 28mm and aperture 26mm. The veriner reads to 60 seconds of arc. Special scratch-resistant, oven-baked crinkle paint on base and body in contrasting colors. The prism table is electro-statically painted with a matte-black powder coating that is hard and long lasting. The body and fittings are streamlined avoiding nooks and crevices around fittings, where the paint could peel in the long run. The holding pillars for telescope and collimator are made of solid metal block to provide durability and enhanced streamlined appearance. All essential parts are interchangeable. The scale and vernier have a fine granular finish for easy readability. 4873 C – Spectrometer, Improved (30mm Aperture): As 4873 B, but with achromatic objectives of diameter 32mm and aperture 30mm. Light box 17.5 x 10.0 x 6.5 cm approx. Equipment set for the execution of bench-based optical experiments, consisting of a light box in a sturdy plastic housing and numerous optical components. The complete set is housed in sturdy styrofoam storage case. The light box has four light outlets: front, back, and two side outlets with hinged mirrors for experiments on color mixing and shadows. All openings are equipped with mounts for optical components in 50 x 50 mm slide frames. Parallel, convergent, and divergent light can be generated by adjusting a mixer lens at the front of the lamp. There are two double-sided slit diaphragms available so that four different beam configurations can be created. Sturdy aluminum construction. The inclined plane, 10x60cm, is hinged to a base, 10x45cm. An aluminum arc scale, which can be mounted on the plane, is graduated to measure the angle of inclination from 0-45°, and vertical height to 25cm. A linear scale graduated in cm, is attached to one side of the incline to measure distances along its plane. A 5cm pulley along with mounting clamp and rod, is fully adjustable. Complete with cylindrical roller with hook. With instructions.